It is September 10 and the peak day of the Atlantic hurricane season from a climatological perspective. We have a lot going on out there and the risk to people from Hawaii to the Lesser Antilles and eventually parts of the Southeast U.S. is increasing as Olivia, Isaac and Florence track closer to land. We also have to monitor a new system trying to develop in te NW Caribbean Sea which could impact the western Gulf region later in the week. I break it all down in my morning video post below. I will post another update after the 5pm ET advisory package is released from the NHC. You may also follow all of my updates in our iOS app. Search “Hurricane Impact” on the Apple App Store. GFS ensembles from the overnight run which show most of the members turning well off the East Coast of the U.S.
Florence has weakened considerably from where it was just a couple of days ago when it had reached category four intensity. Strong upper level winds and cooler sea surface temps have taken a toll on the structure of the storm and this has allowed it to do something very important and critical to the final outcome of its track. Move west. Since Florence does not fill up as much of the atmosphere due to the collapse of deep thunderstorms or convection, it is being steered more by the lower to mid-level flow which is more east to west. This means that the storm will gain much more longitude (move more west) than latitude (north). At this point, the longer Florence remains in this weakened, sheared state, the higher the stakes in terms of where it ends up in about a week. Unfortunately, it looks as though Florence will again become a strong hurricane over the very warm water of the western Atlantic and by the time it does so, it would have tracked far enough south of any weakness in the high pressure (trough) to make the connection and turn north. The irony is glaring: a weaker Florence now means an increased threat for a major hurricane landfall along the Southeast or Mid-Atlantic later. This is not unheard of, however. In 1992, hurricane Andrew underwent a very similar evolution and ended up as the 3rd category five to ever strike the United States. I am not suggesting that Florence will become a cat-5 or make landfall in south Florida, but the overall plot line seems eerily familiar. I generally look at 3 camps of global models: GFS, UKMET and ECMWF. I like to see what the operational or deterministic runs show and then take a peak at the “what if” scenarios outlined in what we call the ensembles or multiple runs of the same models using different variables to show different outcomes. It’s fairly easy to understand what to look for. The more spread in the overall model guidance, the more uncertainty there is and vice versa. So far, the GFS remains the good news messenger with a track that would spare the U.S. coast a direct hit. Even its ensembles are mostly well offshore. On the other hand, the UKMET and ECMWF operational models both paint an ugly picture for the Southeast coast, essentially bringing Florence ashore as a strong hurricane. Right now, the “exactly where” part is irrelevant since we’re talking six to seven days away. The point is, those two global models and most of their ensembles strongly suggest a landfall somewhere. 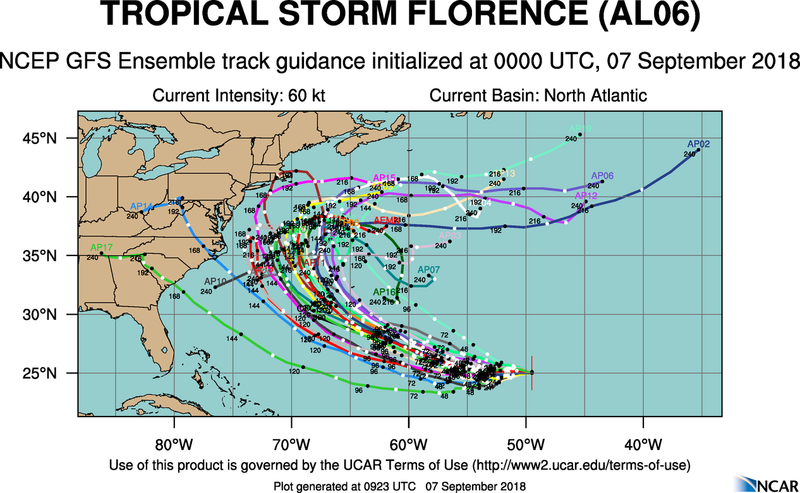 As such, the official NHC track forecast has Florence positioned at 30N and 70W in 120 hours. From there, it either turns more north and we all breathe a sigh of relief or the intensity of preparing for a major hurricane landfall begins to ramp up in to overdrive for a stretch of coastline. I simply do not know how this will play out but the trends are not positive right now, especially considering how warm the water is off the East Coast and the strong, solid high pressure area that is keeping summer very much alive from the Northeast down to Florida. The bottom line is that Florence poses a threat of some level of impact to the U.S. coast (Bermuda too) and we will notice this over the weekend as swells begin to roll in; delighting surfers I am sure. This will be the first signs of a possible major hurricane heading our way. I think we will know definitively about whether Florence turns north in time or not within the next 24 hours. After that, we can begin to focus more on exactly where it could end up. There is also growing concern that we see development from invest areas 92L and 93L as they track across the now warm waters of the Main Development Region. We have several days to monitor the progress but I think it goes without saying that we need to keep a close eye on 92L as models suggest it could impact the Lesser Antilles directly. As if all the activity in the Atlantic weren’t enough to keep up with, we also have what is currently hurricane Olivia churning in the east-central Pacific. Here too we may have the threat of direct impacts for Hawaii but this time, coming in from the north and east. The official forecast from the CPHC indicates that Olivia will weaken below hurricane strength with time. Here too, we have a few days to watch and see how the steering and intensity patterns evolve with Olivia. Obviously, any major rain threat for Hawaii is concerning, much less a tropical cyclone heading their way. I will keep up with the latest on this situation as well. I will address all of these topics more and more in subsequent updates to the blog and within my video discussions which I will also post here at least once per day. August 20 is regarded by many as the beginning of the peak period for Atlantic hurricanes. Just look back at a year ago – we were about to see Harvey regenerate in to what became a category four hurricane on August 25. Andrew struck south Florida on August 24. The list goes on and on…. Fortunately for everyone with coastal interests in the Atlantic Basin, this year is different. 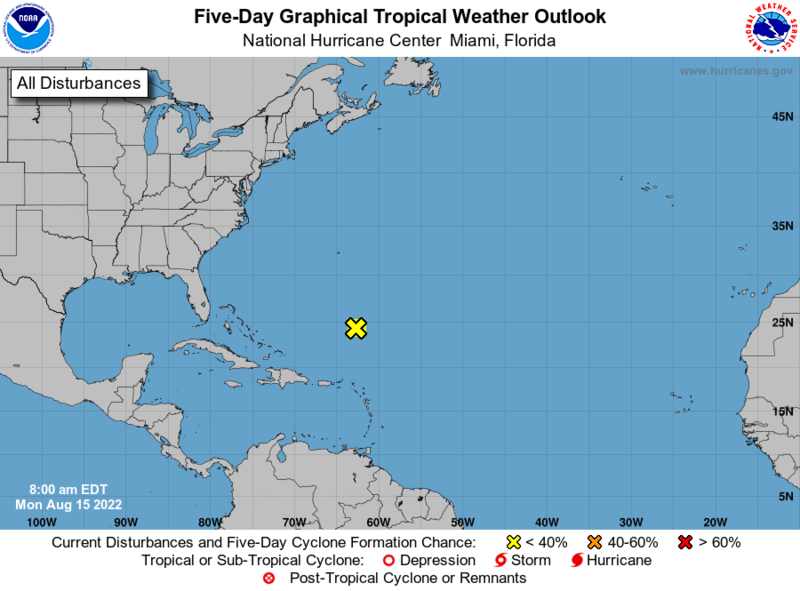 A number of factors have come together to bring us a very hostile environment overall – and as such, I don’t see anything to worry about from the Gulf of Mexico, through the Caribbean and out in to the deep tropics for the next week to ten days. The same cannot be said for the central Pacific where hurricane Lane is causing some anxiety for forecasters and residents/visitors in Hawaii. What looked to be a pretty sure-thing of Lane passing well to the south of the islands later this week has evolved in to a “could be close” scenario – and maybe even more. I go over all of this and much more in today’s video discussion which is posted below. I’ll have another blog post regarding Lane late tonight – which will be beneficial to those in Hawaii since it’s several time zones west of the East Coast, where I am in SE NC. I am going to address TD9 in this blog post and will cover the other activity around the Atlantic and what is going on in the Pacific in my video discussion to be posted early this afternoon. With all of the interest in what happens with TD9 and its potential impact to Florida, I figure I would tackle that first. Some deep convection has developed with TD9 in the region around wetern Cuba and just south of the island. Whether or not this is the start of a strengthening trend remains to be seen. Click for full size image. During the overnight hours, deep thunderstorms began to develop in association with the depression in the vicinity of western Cuba and even to the south of the island. It is not clear just yet if this convection is near the low level circulation center or if perhaps that center has reformed closer to the thunderstorm activity. We will know more as morning visible satellite images come in and recon flies in to the system later today. For now, the NHC is classifying it as a tropical depression with winds of 35 mph. The forecast is very uncertain due to a variety of mixed signals in the overall pattern for the days ahead. Normally, a tropical depression over the Gulf of Mexico this time of year would be concerning. While it is somewhat concerning this time around, the limiting factors are fairly substantial. First of all, strong winds blowing across the top of the depression from north to south are likely keeping the convection removed from the low level center. This is extremely important to the health of the depression and until the shear relaxes, assuming it ever does, we won’t see much strengthening. Most of the models that do develop the depression in to a tropical storm or a hurricane do so in a couple of days – not in the immediate future. So we have some time to watch and see how the upper level pattern evolves over the eastern Gulf of Mexico. With water temps in the upper 80s in most areas of the Gulf, it won’t take much to allow the system to ramp up quickly. The other issue is dry mid level air that would need to be mixed out in order for more efficient convection to take place. Dry air is a stable environment and tends to limit the amount of thunderstorms a tropical cyclone can produce. It is not clear whether or not the dry air will remain a limiting factor. Here too, if it abates and the low can generate deep thunderstorms, it’s only a matter of time before it starts intensifying. Track forecast model plots showing a fairly tight clustering of the models in the Big Bend area of Florida. This could change over the next few days. Click for full size image. The track forecast is also tricky since we are talking about several days out for one and secondly, Florida’s western coastline is shaped that changes in the course of the would-be storm will have potentially huge impacts on who feels what effects. For now, the official forecast calls for the center to pass in to the Big Bend area of Florida, in the northeast Gulf of Mexico. This is concerning to me because the region is very prone to storm surge, even from “weak storms”. Obviously a hurricane would be worse but even moderate tropical storm winds can push several feet of water onshore within portions of the Big Bend region. The next area of concern is Tampa Bay. While most of the model guidance suggests a track farther north, we need to watch this closely since this area is also very susceptible to storm surge from even minor tropical storms. It appears that it will all come down to the mid level trough that is forecast to come in and erode the strong high pressure area that steered the depression in to the Gulf in the first place. At some point, it will round the western edge of the high and begin turning more north then northeast. When and where this happens will determine what part of Florida receives the most substantial impacts. Obviously the intensity will come in to play at that point as well. It’s still just too soon to know with any degree of confidence – something we have grown accustom to dealing with concerning this system. For now, I think that the biggest impact will be heavy rain and the possibility of storm surge flooding along the coast. It goes without saying that if the depression becomes a hurricane, those impacts are elevated quite a bit. We’re going to have to wait it out and see what happens with the upper environment over the next few days. The NHC makes it very clear in their forecast that the intensity portion especially is of low confidence. Sometimes that’s just the way it goes. As I said, I will have a full video discussion posted here by early this afternoon. I will go over the very latest on TD9 plus what to expect as we watch TD8 off the North Carolina coast. Meanwhile, Hawaii is watching TS Madeline and hurricane Lester very closely as both could bring impacts to the region later this week. I will also discuss the coming week to 10 days and what to look for as we head in to September.